Last week, I grabbed a package of strawberries from the store on a whim with no plans on how to use them. 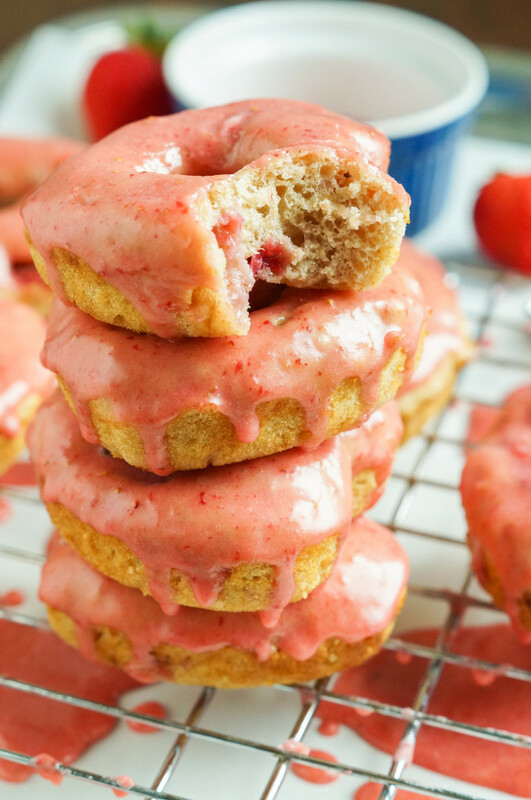 I searched through my pinned recipes and came across these doughnuts. 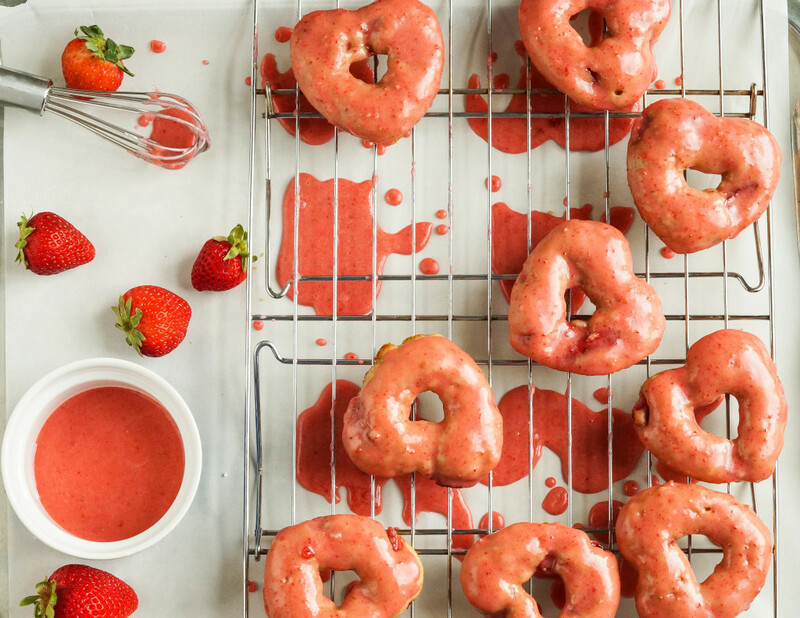 The half whole wheat batter is bursting with strawberry flavor with freshly chopped strawberries mixed right in, plus a blended strawberry glaze for the top. It was the perfect way to close out strawberry season as summer draws to an end. I used a heart shaped doughnut pan to bake the doughnuts: Wilton Nonstick 6-Cavity Heart Donut Pan . I have been on a yogurt kick and have a lot in the refrigerator, so I used whole milk plain yogurt. You can also use buttermilk like the original recipe. A lower fat percentage (not non-fat) yogurt will work, but it won’t be as delicious. 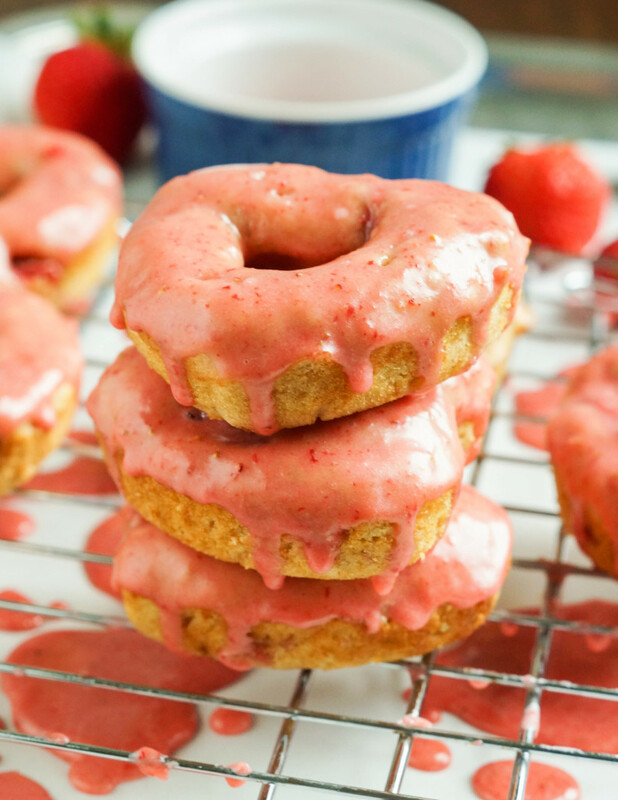 I usually pipe batter into the doughnut pan, but I used a spoon for this recipe due to the chopped strawberries. These are best within a few hours of baking. The glaze will soak into the doughnuts and become a sticky mess after a day. Preheat oven to 400 degrees F. Brush or spray a doughnut pan with oil. In a large bowl, combine whole wheat flour, all purpose flour, sugar, baking powder, and salt. In a small bowl, whisk together yogurt, eggs, honey, and butter until smooth. Mix in chopped strawberries. Fold into the flour mixture until just combined and no streaks of flour remain. Use a small spoon to transfer batter to prepared doughnut pan. Do not overfill. Bake in preheated oven until the doughnut springs back when gently pressed, 8-11 minutes. Allow to cool in pan for 5 minutes before transferring to wire rack to cool to room temperature. If you only have 1 (6 cavity) pan, repeat with remaining batter. In a blender, combine the three strawberries and 1 cup of the powdered sugar. Puree until smooth. Add more powdered sugar until desired consistency. Dip the top of each cooled doughnut into the glaze and place back on wire rack, glaze side up, until set. Thanks! They may have been a sticky mess the next day, but that didn’t stop me from eating the last couple. Beautiful!! Want!! I have got to get a doughnut pan…!! Could you save the glaze separately warm up the leftovers and glaze them before eating? You could to keep the glaze from breaking down, but the doughnuts themselves would also be best within a couple of days unless frozen. Gorgeous pictures Tara! Been a long time since I’ve made. Think I’ll make a batch soon before strawberry season is over!